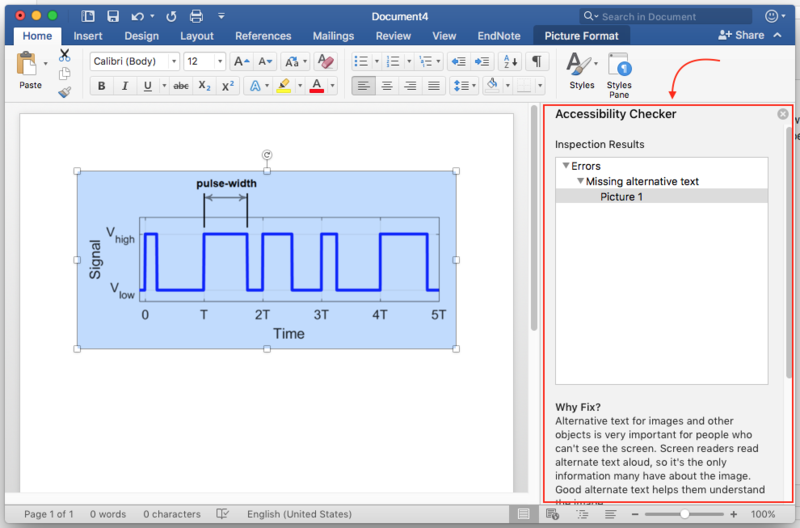 Much like the Word and PowerPoint spell checker detects possible spelling and grammar errors, the Word and PowerPoint Accessibility Checker will detect possible accessibility issues within your document or presentation. Running the Accessibility Checker is a critical process in optimizing your documents and presentations for accessibility and should be done when you have completed your project. 2. Select the Review tab and click the Check Accessibility button. 3. Review the list of potential errors in the Accessibility Checker pane. 4. Resolve any outstanding accessibility issues listed in the results. NOTE: Unfortunately, the Microsoft Office 2011 for Macintosh version of Word and PowerPoint do not contain an accessibility checker.